Western Medicine as seen today has a strong scientific basis in its development. The pathogenesis of most diseases and their symptomatology and physical signs are well studied and understood. The management of patients is based on firm understanding of these disease processes. In contrast, Traditional Chinese Medicine came about through the experience of many generations of practitioners over thousands of years. Undoubtedly, many of these treatments have proved to be effective in their own way, however, firm scientific basis is still lacking. While most Western Medicine advocates control of disease by eradication of pathogens and surgical removal of diseased organs as in the case of cancer, Traditional Chinese Medicine seeks to improve resistance against disease. There is probably a great wealth of therapeutic value in Traditional Chinese Medicine, which has not been discovered or explored fully. By combining the knowledge of both Western and Traditional Chinese Medicine, one might be able to improve the results of efficacy of treatments and the survival of patients. The integration of Medicine from East and West will take time to evolve and will need interested physicians from different parts of the world to work closely together to realize such a possibility. This book is an attempt to bridge the medical world of two great and ancient civilizations in their approach to the treatment of disease. It is informative with a detailed account of the history of medical development. It is highly recommended for those medical practitioners from both East and West who are interested to explore alternative medicine and research new areas of the medical frontier. Scientists interested in history of medicine, herbal medicine, ethomedicine and phytomedicine; urologists, endocrinologists, clinical pharmacologists. Acknowledgements. Contributors. Preface I (E. Solcia, C. Meloni). Preface II (E.C. Tan). Preface III (F. Debruyne, J. Mattelaer). Introduction (P. Marandola, S. Musitelli). Foreword. 1. The brief comparative history of TCM and WM (S. Musitelli, Wei Li Chen). 2. Brief introduction to TCM in urology: An entry for a medical dictionary (S. Musitelli, P. Marandola). 3. 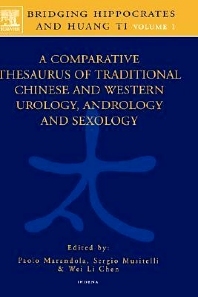 The visceral manifestation of urology, andrology and sexology (S. Musitelli, Wei Li Chen). 4. [Bing Yin Yu Bing Li] Aetiology and pathology. I: [bing yin] Causes of diseases (S. Musitelli, Wei Li Chen). II: [bing jing te dian] The characteristics of the pathogenesis (S. Musitelli, Wei Li Chen, P. Marandola). III: [yu sheng zhi qi xiang guan de jing luo] The channels and collaterals connected with external genitalia (S. Musitelli, Wei Li Chen). IV: [bian zheng] Differential diagnosis (S. Musitelli, Wei Li Chen, P. Marandola). V: [zhi ze] Therapeutic principles (S. Musitelli, Wei Li Chen). 5. [Dian Xiang Bing Li] Typical diseases. [mi niao xi tong ji bing] Diseases of the urinary system (S. Musitelli, Wei Li Chen, P. Marandola). 6. [Wai Zhi Fa] External treatment and others (S. Musitelli, Wei Li Chen). 7. [Cao Yao] Herbal medicine (S. Musitelli, P. Morazzoni, Wei Li Chen). Table of apothecaries' weights equivalent.